Doughnuts. Round, sugary morsels of perfection. But sadly often not an option for those with a sweet tooth looking for a vegan or gluten free option on the dessert menu. Not at Nútie Donuts. This pastry palace is stacked wall to wall with delicious treats that are totally gluten free, with vegan and dairy free options available as well. The kitchen, which hosts some of the best pastry chefs in Sydney, turns out a mouth-watering roster of dessert delights that will keep you coming back just to see what they think of next. 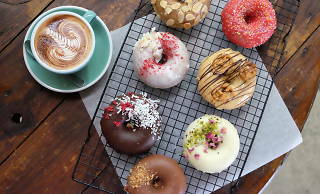 If you don’t get down on doughnuts then take your pick of the other sweet treats on the menu. Maybe you’d like to sink your teeth into the chocolate chip cookie? Or try out one of the four cheesecake flavours including Snickers and mango and passionfruit. All items on the menu are best enjoyed with one of Nútie's coffees. You can pick up individual doughnuts or opt for a box of these delicious devils. 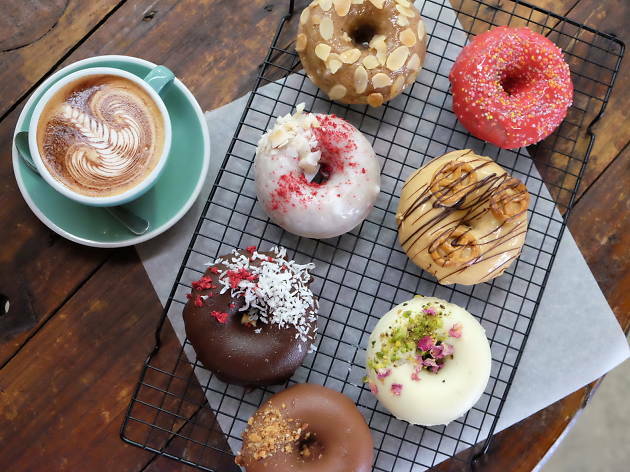 Boxed options include the classic vanilla cinnamon donuts, an assorted selection of treats or you could go for the vegan option which includes a box of six assorted vegan doughnuts. Custom catering options are available in packs of either 60 or 100. But all of that pales in comparison to the holiest (get it?) of desserts- the doughnut cake! Enough to serve 15 people, it is available in a number of flavours including double chocolate, rosewater and pistachio or Bounty.